'Bigfoot' can't help but look forward to a fight with 'The Warmaster'. Antonio Silva has plenty of respect for his UFC Fight Night opponent, Mark Hunt. Before he hit the big time, Silva used to watch Hunt, and later on, got to know him, even training with him at American Top Team in 2012. So, heat? There’s no heat between the two headlining heavyweights. It’s nothing but respect, nothing but business between them. But moving on towards the future, ‘Bigfoot’ has something a little more personal in mind. Namely, Josh Barnett. The two verbally sparred in the media years ago. At the time, Barnett said Silva’s only advantage is his size, which angered Silva as dismissive to his other skills — for example, he holds black belts in both Brazilian jiu-jitsu and judo. Silva quickly fired back, calling Barnett ‘stuck-up’ and saying he’d like to "beat him up and close both of his eyes." After a brief explosion, however, the feud has mostly died down. 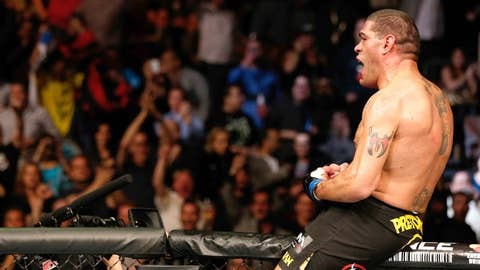 "He stopped talking but I never forgot what he said," Silva said on Thursday. "He’s a top heavyweight, and I want to fight the top heavyweights. I have a little bit of anger in my heart for him, and I want to fight him one day." I have a little bit of anger in my heart for him, and I want to fight him one day. The two were in the Strikeforce Heavyweight Grand Prix field, but a fight between them never materialized. A few years later, the matchup makes as much sense as ever. Currently, Silva is rated at No. 4 on the UFC rankings while Barnett is at No. 6. Both have other business to attend to first. While Silva has the aforementioned Hunt on tap, Barnett is preparing to fight Travis Browne at the end of December.